The “Maker Culture” has been in the news lately. Creative spaces have cropped up all over the country, equipped with 3-D printers, laser cutters and other tools, offering amateur enthusiasts of all stripes a place to try out new ideas and build projects on their own. It’s nothing new at SPR Consulting. You could say, it’s all in a weekend’s work. In fact, it’s part of SPR’s culture to encourage and celebrate any kind of creativity in whatever form it takes: from brewing beer to feeding hamsters, to using voice command technology, to building a coloring book empire. Here are some fun projects highlighted at recent SPR Show & Tell lunches. 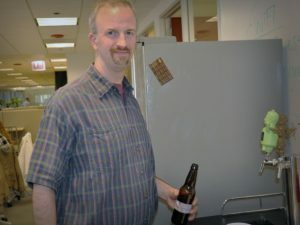 Brian Chorba, SPR’s Marketing and Salesforce Administrator, always enjoyed craft beers and decided to try his hand at making his own a few years back. Even though his first attempts in the 1990s were less than palatable, he tried again more recently by going to a beer-making class with his girlfriend. 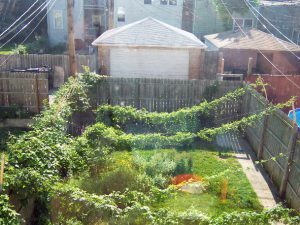 Fast forward a few years and his girlfriend is now his wife, and Brian not only brews beer at home, but grows the hops in his southside Chicago garden to get just the hoppy flavor he wants. 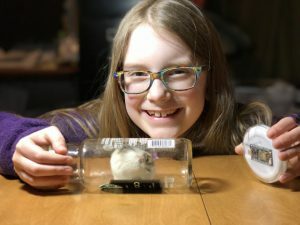 When David Kinney’s daughter turned seven, she was allowed to get a hamster. The only problem was remembering to feed it. So David, Principal Architect at SPR, started playing around with an internet-enabled button and light that he could program to turn on at 6 pm feeding time. Once his daughter fed Acorn the hamster, she could push the button and turn off the light. It was a simple yet effective way to teach his daughter responsibility; and it gave David a chance to evaluate a new IoT platform. This wasn’t his first project for his daughter. When she was in preschool, she needed to know the weather so she could pick out her clothes for the next day. David built a circle of colored lights that represented the next 24 hours, and used different light colors to show upcoming weather conditions. His daughter loved it and it still serves as a colorful nightlight. Bryan O’Connell, Senior Consultant, has been interested in building and coding since the fifth grade. After attending a conference on building hosted web apps, he built a prototype of a hosted web app using spr.com, and integrated Cortana in it. If you asked her, “Hey Cortana, how can SPR help me with [topic]?” she would do a search against the company website and return matching content. He demoed this for a few management folks early last year. Separately, CTO Matt Mead was working on an idea for an IoT lab environment in one of the conference rooms. When he heard about the Cortana demo, he invited Bryan to join him in the effort. He already had a prototype using Amazon’s Alexa. 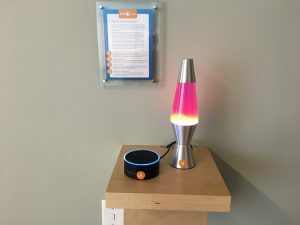 Bryan programmed Cortana to help manage some of the IoT items in the SPR labs – a climate sensor, door lock, and a light mechanism – and some others that aren’t even released yet. Through commands like, “Hey Cortana, please turn the light on using Sapphire,” Cortana will search through applications on your computer and use those apps to perform things you asked her to do. She does this as an integrated assistant in Windows with code running in the cloud. Raynay Valles, a QA Test Analyst at SPR, has always wanted to get into publishing. Years ago she tried it – designing a book, finding a printer, placing an order, and storing boxes of printed copies in her garage. Today, she’s discovered that self-publishing is a whole new ballgame. 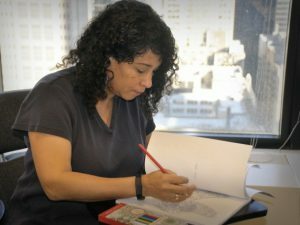 After researching the top selling items on Amazon, she discovered that six of the top 50 books sold were coloring books for adults. Bingo! Raynay always loved to draw. She published her first coloring book in 2014 and is currently working on her third. Raynay encourages others to try self-publishing, and loves to explain the ins and outs of how she’s done it. She even helped a firefighter publish a book of his own poetry. Building, creating, exploring – you might even call it tinkering – these are essential skills at SPR. To promote the spirit of makers and to give hard workers a place to relax and play, SPR’s new remodel will include a large ‘maker space’ in the corner of one floor. 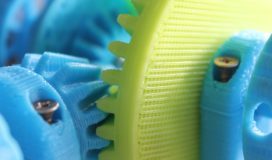 Equipped with all manner of tools, 3-D printers, cutters, supplies, and workbenches, employees will be able to work on any kind of project they want to explore. “The destination isn’t important; it’s the journey that counts,” says CTO Matt Mead. “It’s another way to open minds and learn new ways to solve problems. I think the people who work here are curious by nature. So we’re giving them the tools to let their imaginations take off.” Look for more interesting personal projects to be highlighted in future SPR Show & Tells.